S omething unusual happened in a debate in the European parliament this week. 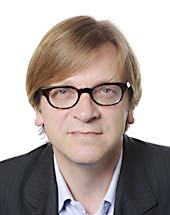 The arch-European federalist Guy Verhofstadt was applauded by Ukip MEPs as he laid into Donald Tusk for enabling the extension of Britain’s Brexit deadline until Halloween . No such extension should have been allowed, said Verhofstadt, to the evident joy of the Brexiters. Mr Babis, who is a member of Guy Verhofstadt's EU party group ALDE, is subject of a police investigation into his possible involvement in an alleged 1.7 million misuse of EU subsidies. Prague’s public prosecutor said the police had handed investigation files to prosecutors, according to a spokesman. © Provided by Local News RSS EN-GB. European Parliament’s chief Brexit co-ordinator has blasted MPs for dithering over Brexit and expressed his fear that Britain’s withdrawal will "poison" the European elections. Speaking at the European Parliament in Strasbourg, Guy Verhofstadt said he fears that the delay to Brexit will “continue the uncertainty. European Commission president Jean-Claude Juncker told MEPs the EU has "nothing to gain" from the disruption a no-deal Brexit would bring to the UK. Mr Juncker said: "We have adopted the necessary contingency measures and we are ready for a no-deal Brexit. "But our union has nothing to gain from great disruption in the United Kingdom. Liberal group leader Guy Verhofstadt warned on Tuesday (16 April) that the decision to grant the United Kingdom a Brexit extension last week could “poison” the European elections, in which the UK is now likely to take part. “I fear that it will continue the uncertainty. I fear that it will prolong the indecision.